Parents will receive the badges after signing a pledge that they will not have their daughters cut. BEIRUT — Doctors at two Cairo hospitals were to pin blue ribbon badges to the clothing of newborn baby girls on Wednesday as they launched a campaign to persuade parents in Egypt to “say no to female genital mutilation”. Parents were to receive the badges – which resemble the Arabic word “no” and look like an upside down version of awareness ribbons for HIV-AIDS and breast cancer – after signing a pledge that they will not have their daughters cut. Activists hoped more hospitals would join the campaign, which launched on International Day of Zero Tolerance for FGM. Many families see FGM as a religious obligation, and a way to preserve their daughter’s virginity. “It is a wrong and ugly belief. We have to make clear that FGM (does not stop) sexual desire,” said paediatric doctor Amira Edris, who works at one of the Cairo hospitals. FGM, which commonly involves the partial or total removal of the external genitalia, is practised in a swathe of African countries, and parts of Asia and the Middle East. It is often done by traditional cutters with unsterilised blades, but there is an increasing trend for FGM to be carried out by health professionals –particularly in Egypt, Guinea, Kenya, Nigeria and Sudan. 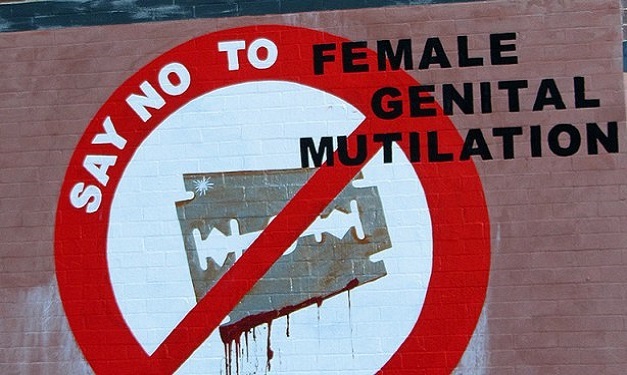 Global anti-FGM group 28 Too Many, which is working with the Egyptian hospitals, said the “medicalisation of FGM” was hindering efforts to end the practice. FGM can cause a host of serious health problems, including infections and infertility. “We couldn’t save her … she bled to death. I remember she started to hallucinate … and she knew she was going to die – this really traumatised me,” she added.